Goose Pond Fish and Wildlife Area is located in Greene County, Indiana. Sunrises and Sunsets on the property can be amazing and the wildlife, especially birds, is extremely diverse. 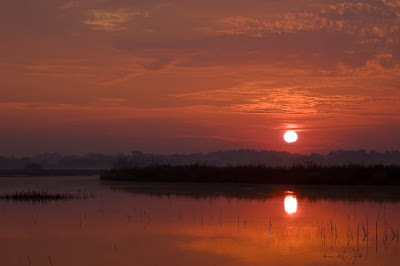 This photo was taken at sunrise over one of the many marshes. The clouds in the sky really were a red color from the rising sun. My main goal when I was there was to photograph Monarchs and find some rails. I succeeded on both accounts. I was able to find a King Rail at a distance of about 10 feet. There was no need for binoculars. I was also able to find many Monarchs warming up in the sun in the early morning so many sat still which made it much easier to photograph them. 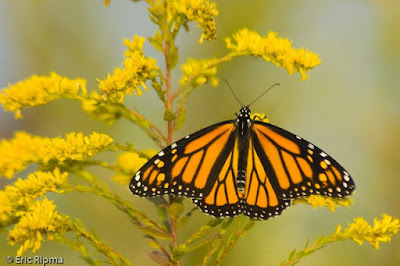 These photos were taken in the middle of September when the Monarchs migrate through Indiana. Checkout more great SkyWatch Posts here. Beautiful, reflective moon. Love the colors! Excellent monarch shot too - I meant to get some butterfly pictures during the late summer, but never did....next year! What a shot..., and what a butterfly!! Nice weekend to you from Anne in Norway. Two spectacular photographs. I can't believe how red the first one is. The monarch is wonderful, too. Beautiful skywatch photo. I love the butterfly too. Very nice photo. the monarchs are always so lovely, and this is a beautiful picture. very calm photo. What a wonderful contribution to SWF. Beautiful photo's. Love the colors in BOTH! Take care and thanks for sharing your pics. Wow, what a beautiful sunrise, Eric! I love to watch the sun rising or setting over such a calm body of water -- such a sight never gets old. Great sunrise with perfect refletion and beautiful butterfly too. WOW... that first photo is fantastic. Sensational sky color that I don't think I have witnessed around here! Both photos are lovely ... but your sky watch was breathtaking! Have a wonderful weekend! Nothing more to add! Both photos are stunning! That first photo is positivly dreamy! Both are beautiful! The butterfly is a beauty, but I especially love that lovely peaceful sunrise. Love meeting new nature friends! Great sunrise, and the monarch was excellent! Happy SWF! I'm not very reluctant about being up before the sun rises but when you're rewarded with a sight like this it's well worth it.